The generational shift is easy to spot elsewhere. 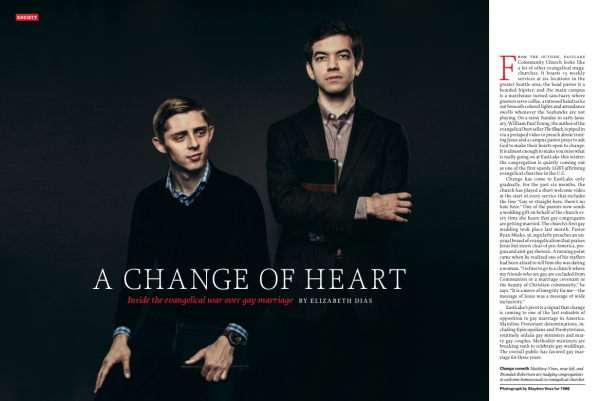 Consider the Reformation Project, a Wichita, Kans.–based effort by 24-year-old gay evangelical activist Matthew Vines to raise up LGBT-affirming voices in every evangelical church in the country. To reach that goal, he is training reformers in batches of 40 to 50 at regional leadership workshops who can go back to their home churches and serve as advocates for LGBT inclusion. The Reformation Project has staffers in three states, representatives in 25 more and plans for a presence in all 50 states by 2018. If you are a paid subscriber, Time will let you read the entire article. Even better, head tosite for an in-depth analysis.